Mark Marino provided all the pictures and text for this section. 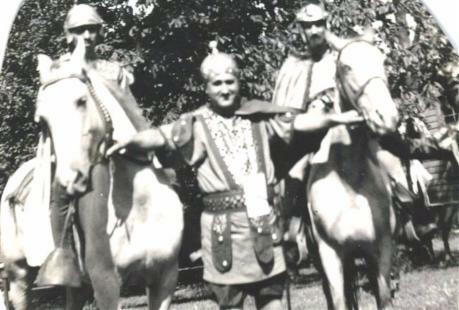 The play was similar to the one traditionally preformed in Greci and was presented in Lodi in August for many years as part of the week long Feast of San Bartolomeo. Nick Fofa is the one on the horse. The Director in the photo was Dan (Donato) Meola. He is at the far right of the picuture holding the scrip. He was born in Greci in 1900 and came to America in 1924. He settled in Canton, Ohio. He was the grandfather of Christine Frasca Maliza a grecicousin. Donato and his wife had two daughters. Rose (Carosena), Christine's mother and Anita. They moved to the bronx, NY aroung 1930. Donato belonged to a club dedicated to St Bartolomeo and was the director of their production every year until the club was disbanded. 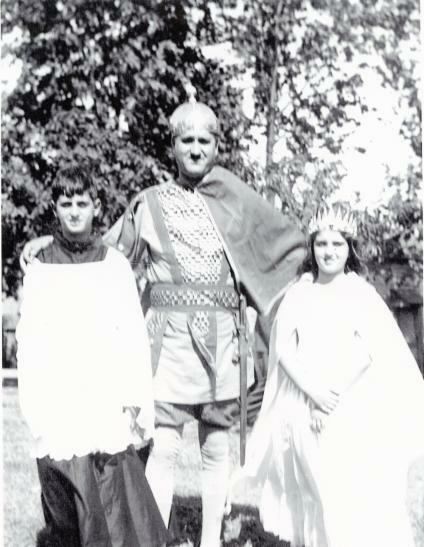 This is my father leading the two horsman at the begining of the play. In this pictue Maria my sister is setting beside the Queen (this part was played by a man). The Bad King is on the far left. This part was played by Antonio Bonetti. The angel in the back was played by Joe Deminno. During one of the years when the Bad King was killed, he was lying on the stage and his hat fell off. He moved to put his hat back and this action was remembered by everyone. He received a lot of teasing. The director of some of the plays was Francesco Demmino. He was in a wheel chair and could not walk but he was at all of the practices and the performances. 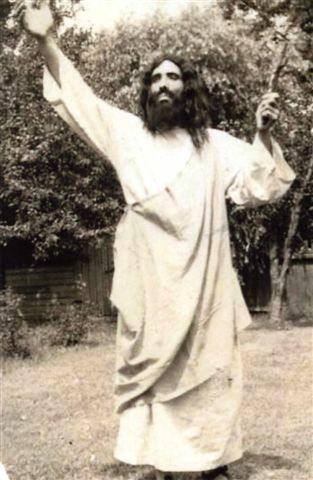 Editor's Note: My thanks to Mark Marino for supplying all this information about the St. Bartolomeo Plays in Lodi New Jersey. His help is greatly appreciated.